The Briefing Room's annual running thread for deaths in calendar year 2019. R.I.P WWF hall of Famer "Mean" Gene Okerlund. He was 76. Beginning his career in radio, Okerlund began announcing pro wrestling bouts in 1970 and joined the World Wrestling Federation in 1983. He stayed with WWF throughout the Rock-and-Wrestling era that saw a boom in the popularity of the "sport," then joined WCW, the WWF's chief rival, in 1993. In 2001, ahead of WCW's collapse, he rejoined what would soon become WWE, where he would remain until his 2009 retirement. For most of his career, Okerlund affected a mostly straight, but distinctive fast-paced patter and was the oft-beleaguered straight man in many-a WWF promo during his career. No cause of death was stated. He had previously undergone two kidney transplants. For some reason, I thought he was already dead. The local bowling alley has his pizza. 76 is like 102 in pro wrestler years. Einstein, the older brother of actor Albert Brooks, began his career as a writer for variety shows such as Sonny & Cher and the Smothers Brothers Comedy Hour. In the 1980s he became best known for his character "Super Dave Osborne," a hilariously inept stuntman. He continued acting in other comic roles, including Marty Funkhouser in Curb Your Enthusiasm and a role on Arrested Development. Einstein died of suspected complications of cancer. Bummer. I used to love watching his Super Dave Osborne character on Bizarre with John Byner. They did a hilarious duet of the theme song from "An Officer and A Gentleman". Sooper Dave reminds me of the next Sooper conservative, that can recite the Constitution, whilst riding an outhouse with no hands, on his way to the next college law school debate championships. Paul Ryan, Trey Gowdy, etc. Just couldn't resist could you? A lifetime resident of southern California, he was the son of symphony conductor Carmen Dragon; Daryl's brother, Dennis, later had regional success as a musician. Daryl Dragon first earned fame working with The Beach Boys as they were transitioning away from strictly beach music and began broadening their sound. It was with the Beach Boys that he earned his "Captain Keyboard" nickname. He kept the motif when he broke from the band in 1972 to launch a duo act with Toni Tennille, whom he married in 1975. He continued to contribute keyboards to numerous acts including the Carpenters. 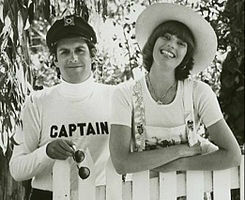 As the Captain and Tennille, Toni would be the lead singer while Daryl would silently play keyboards, charting several top-40 hits. The two divorced in 2014, with Tennille later citing lack of intimacy and Dragon claiming he had been drugged and that his worsening medical state had played a role in the unexpected divorce. The two reconciled toward the end of his life. Dragon died January 2 of kidney failure. I guess he took ‘do that to me one more time’ a bit too literally. The company disclosed in December that Blake had been diagnosed with lymphoma. At the time, Blake had the lymphoma was “treatable.” He had expected to work through his illness. It could not be immediately determined whether the lymphoma was the cause of Blake’s death. The Nordstroms seem like good people. 58 is too young. Like many artists from R&B’s original heyday in the 1940s, ’50s and ’60s, Brown — remembered for numbers such as “(Mama) He Treats Your Daughter Mean” and “Teardrops From My Eyes” — was a victim of what ABC News once declared the “dirty little secret of the music business.” Through skewed contracts and sloppy bookkeeping, record companies reaped the profits of original R&B sales and subsequent reissues while leaving performers, many of whom were African American, in poverty. “Where’s the check?” Brown demanded to know. In 1983, she found a champion in Howell E. Begle, then a partner in a Washington law firm and a boyhood fan of her music who by then had amassed a library of old 78s — many of them Brown’s recordings — numbering in the thousands. During a years-long pro bono legal fight, Mr. Begle represented Brown and other R&B artists, helping them claim royalties from past sales, industry-standard royalty agreements going forward, and other benefits in what became known as the royalty reform movement. Mr. Begle, 74, died Dec. 30 at a hospital in Lebanon, N.H., of injuries he sustained in a skiing accident a week earlier. His wife, Julie Eilber, confirmed his death . . .
"One of the [government's] fundamental purposes was to throttle competition," Kelleher told me. "Their thesis was that if a new airline was gonna take one passenger—one, that's what they said—one passenger away from an existing airline, it can't be certificated....The fact that the existing airlines had 90 percent of all the revenue passenger miles in 1938, and also had 90 percent of all the revenue passenger miles in 1978, at the time of deregulation, would give you somewhat of a hint" . . .
RIP Mr. Kelleher. You are now free to move about heaven . . . Saw them in concert once, Great performance. I heard the reason they divorced was that he did not want her being saddled with the debts from his medical treatments. Supposedly he put everything in her name, so that he was literally penniless and the hospitals could not come after his estate. Indeed. Pro bono? To recover their royalties? It doesn't often get more righteous than that. Bless him! Lassiter played in the NFL from 1995 to 2004. His career was never Hall of Fame caliber (he was only once considered for the Pro Bowl), but the free safety had brief moments of spectacular play, including a playoff-clinching performance in 1998 where he recorded four interceptions in a single game (the same amount he had recorded the entire year up to that point). Following his playing career, he dabbled in broadcasting and coaching (his highest level in the latter being defensive backs coach for the 2012 Las Vegas Locomotives, the de facto champion of the UFL in its final season). Lassiter died January 6 of a heart attack sustained while working out. It's enough to make me wonder how he avoided being disbarred. I keep telling people that working out is dangerous,but do any of them every listen to me? She occasionally sang backup for Mr. Young, most notably at the 1994 Academy Awards telecast, when he sang his Oscar-nominated song, “Philadelphia.” But it was not until she was in her 50s that she recorded her first album, “Pegi Young” (2007). She followed it with four more. Page created in 1.205 seconds with 21 queries.